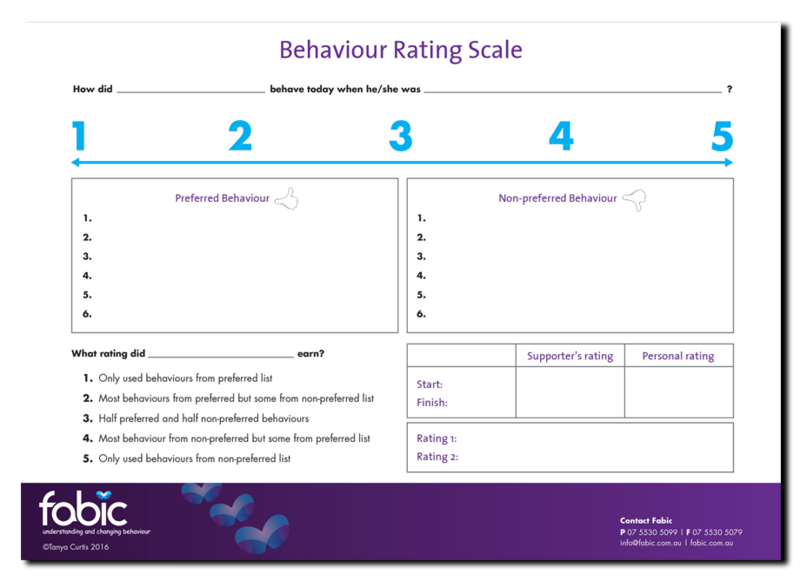 The Fabic Behaviour Rating Scale is used to support people to have the same understanding of what behaviours and words are expected from someone in a particular situation. This chart first came about when we had a young man, whom we will call Jack, who was constantly in trouble in the classroom. The teacher had Jack sitting away from the rest of the class as he was ‘too disruptive’. What he wanted more than anything (his wanted outcome) was to return and be with his peers. His teacher had made the comment ‘when you show me you have been good, then you can sit back with the kids’. Jack asked at the end of each week, for quite a number of weeks, ‘can I sit back with my friends now?’ The teachers’ response was always the same ‘when you have been good’. Jack was becoming increasingly frustrated as according to him, he was using behaviours he thought would be classed as ‘good’. In this example both people had different pictures of what ‘good’ looks like. The behaviour rating scale was used to provide each person (i.e. teacher and student) with the same picture of what ‘good’ looks like. First we listed the behaviours that the teacher in this instance considered ‘non-preferred’. Second we provided the exact opposite behaviours (i.e. the incompatible behaviours) in the preferred list. These were the behaviours the teacher wanted to see. The student and teacher came to an agreement that, if he was to receive a rating of 1 or 2 for one week, he would be able to return and sit with his peers. Now, with the same message as his teacher, this student took one week to return to his classmates. In this example we used the classroom; however, these same principles can be applied to the park, playground, shopping centre, restaurant, dinner at home, work and absolutely anywhere when creating a behaviour rating scale for someone. The key is to ensure that each person has the same message as to what is expected in the situation.